There’s not much good to report from yesterday’s St. Louis Cardinals 7-3 loss to the Pittsburgh Pirates — Lance Lynn gave up a first inning grand slam, the Cardinals only had six hits for the game, their record at Busch Stadium is now 17-18. Yet the newest member of the bullpen made his major league debut — and pitched two perfect innings. Yes, really! Barret Browning faced six Pirates, three in the sixth and three in the seventh, and retired them all. Until yesterday morning, the only Barret Browning I’d ever heard of was Elizabeth Barrett Browning. (Obviously I need to pay more attention to the Memphis roster.) But now, welcome Barret! And what better way to honor him than with poetry? Struggles had previously ruled the ‘pen. Yet you approached the mound calm, filled with zen. Your first foe is out when he grounds to third. The second is gone swinging at strike three. Grounder to short, inning ends with no word. Just cheers and wondering who you might be. Back out again, a big test right away. Yet McCutchen flies out, so one retired. Full count, yet another out for the day. Grounder ends the inning. We are inspired. Your perfection won’t continue, we know. Our admiration still has room to grow. So welcome, Barret, to the big leagues at last — at age 27 and after six years in the Angels’ minor league system, it’s great to see you get your shot. And, with the way you pitched, we all hope you’re around for a long time in St. Louis and continue to have success. This bullpen definitely needs some stability. I wasn’t the only one inspired by Barret’s pitching — check out Laura’s own poetic tribute here. 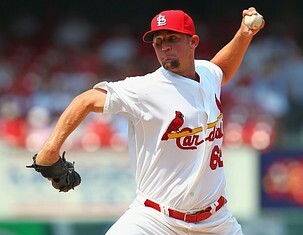 This afternoon, the Cardinals will try to salvage the final game of the series with Jake Westbrook facing Erik Bedard. Game time is 1:15 p.m. And, if Barret pitches again, look for more poetry — though definitely not another sonnet! The Bard would be proud — and 14 lines of 10 syllables each IS hard, especially for those of us who are taxed by the meter of a limerick. That was excellent! I cheated by using an existing poem but you did it the hard way by creating your own. I love it!